Ha ha. Looks like they think they can ignore Jason Gratl’s letter the same way they ignore all correspondence. Let’s see how that works out for them. They just don’t get it… “it’s gone out on the website to all landowners”? How does that work? He doesn’t grasp anything to do with computers or the internet. I imagine the lot of them are challenged and the best they can muster is email and bloody Facebook! It appears they are incapable of composing a letter in response to the one issued by Trustee Kaljur’s legal counsel, Jason Gratl. Why haven’t they retained a lawyer to represent them and respond properly? Look at the dog’s breakfast they created to inform Trustee Kaljur she was indefinitely suspended. They should be embarrassed. Feb. 14, 2019 4:30 p.m. 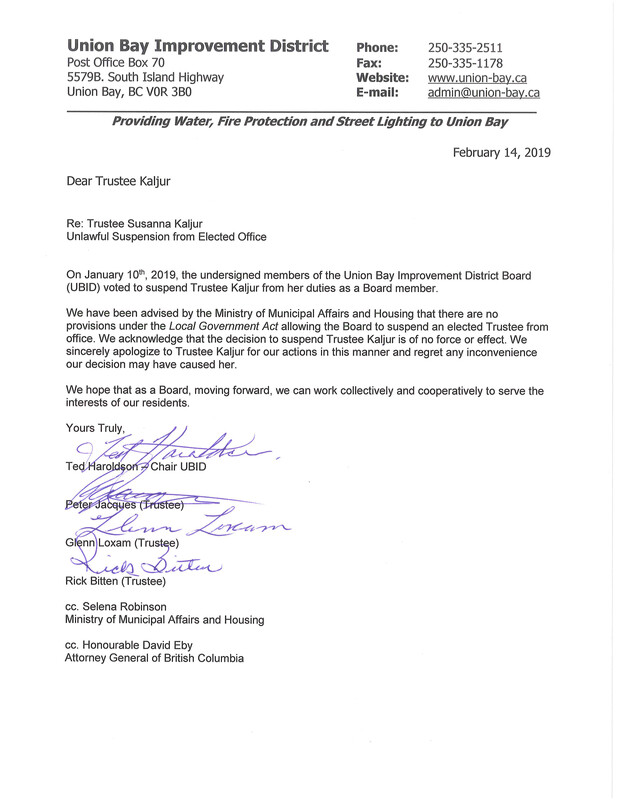 The Union Bay Improvement District board has complied with one of the demands of a letter sent by the lawyer of suspended trustee Susanna Kaljur. On Jan. 10, UBID trustees Ted Haraldson, Rick Bitten, Glenn Loxam and Peter Jacques voted unanimously to suspend Kaljur from the board, for what they deemed as inappropriate behaviour. Kaljur challenged the suspension, saying it had no legal standing. The board received a letter from Kaljur’s legal counsel on Feb. 12, demanding a published apology signed by Haraldson, Bitten, Loxam and Jacques, with the threat of a lawsuit for non-compliance. There was a Feb. 15 deadline to meet the demands of the letter. On Feb. 14, the UBID board posted a letter of apology on its website, signed by the four trustees who originally voted to suspend Kaljur. “We have been advised by the Ministry of Municipal Affairs and Housing that there are no provisions under the Local Government Act allowing the Board to suspend an elected Trustee from office,” read the note, in part. “We acknowledge that the decision to suspend Trustee Kaljur is of no force or effect. 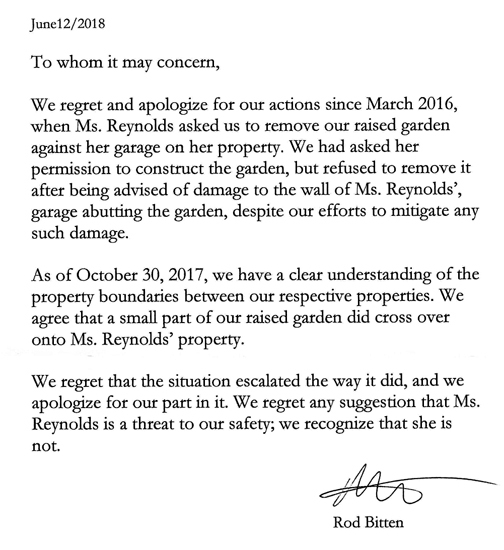 We sincerely apologize to Trustee Kaljur for our actions in this manner and regret any inconvenience our decision may have caused her. Kaljur pointed out that the publicly posted apology was only one of the demands in the letter. “There are a number of issues which the board has not addressed adequately, which may result in further legal action,” she said. Kaljur is also questioning the validity of any decisions that were made at UBID board meetings during her illegal suspension. “The board meetings of January and February 2019 occurred without my knowledge or public notice, due to my being illegally suspended,” she said. 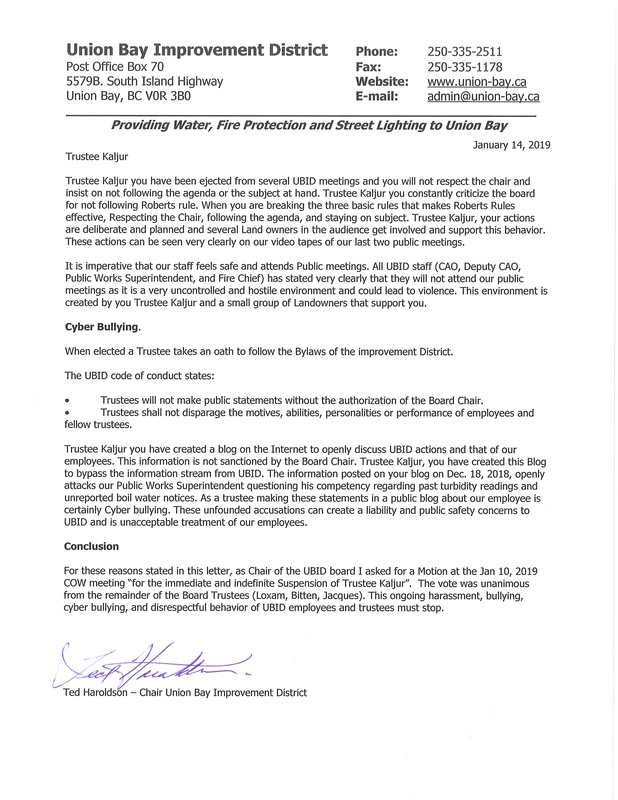 “Now that the board has agreed this was illegal, this decision renders those meetings null and void which includes the highly irregular alteration of Union Bay’s election days and AGM. The Feb. 15 deadline remains in place for all other demands in the letter. “Until all these conditions are met I will not be accepting any apology and I will have no other recourse but proceed with my lawsuit,” said Kaljur. When contacted by The Record, Haraldson said the board has complied with all the demands it deems reasonable. The publicly posted apology will not be sent to landowners by mail. When asked how those without computers are to receive the apology, Haroldson was curt. According to Haraldson, the change of dates for the election and nomination period was to rectify an error in the original posting and was strictly administerial, in order to comply with Elections BC. As for a personal apology regarding the allegations of defamation of character, Haraldson sees no reason for an apology. “There is no defamation of character,” he said. Next Post Ted Haraldson – protesting Jan. 2011 lock out of electorate by UBID board. Now he pulls the same crap!